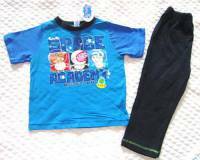 Size 5 George Pig (Peppa Pig) Children's Spring/Autumn Pyjamas. These pyjamas with a short sleeved top and matching pants set with puff paint print of George Pig, the cute little brother of Peppa Pig!, are the perfect pyjamas for your little boy! This two piece George pyjama set is 100% cotton. These George Pig Pyjamas are also available in Size 1, Size 2, Size 3, Size 4, and Size 6.